Upon finishing this piece I realized that the composition is actually really close to this sketch I did of Dave Sim's Cerebus several years ago. Oh well. What can ya do? 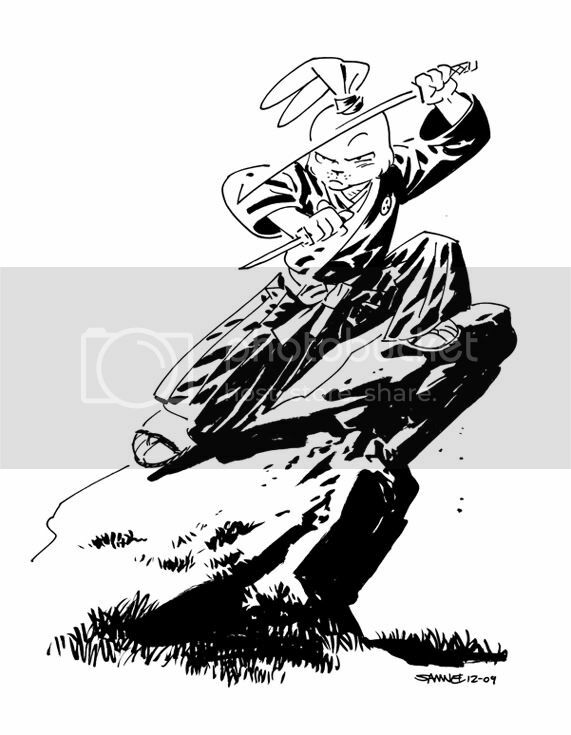 For those unfamiliar with Stan Sakai's Usagi Yojimbo, be sure to track down the trades, okay? You'll be glad you did. Truly truly FANTASTIC work. This is by far one of my favorite things you've done, and I just love your work either way. I've been a fan of Usagi since the Ninja Turtles cartoon when he showed up as Space Usagi. Woo. And Stan Sakai is a great dude, got him to sign and sketch in the first trade of Usagi.